Memories at Christmastime – What's for Dinner Moms? I received a very special gift this week. It doesn’t look like much but brought me to tears. 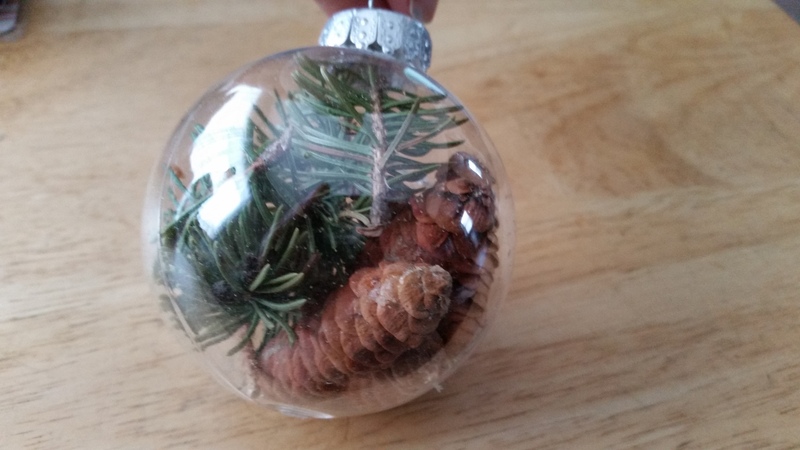 My aunt sent each of our family members a small Christmas tree ornament filled with small pine cones and branch clippings from the pine tree planted at my grandparent’s grave. I was 10 when my grandmother died and I never met my grandfather as he died a month before I was born. The memories I have of my grandmother are mostly from Christmastime. Though I remember going to her house quite often, I can still walk through it in my mind, almost all of the big things I remember are at Christmas Eve. I remember as soon as you walked in the front door to grandma’s house the dining room table was right in front of you filled with food. German sausages, kuchen, cookies, and pigs in the blanket (our family version of German cabbage rolls). Look to the right and the buffet was covered in decorations and still more goodies from friends and family. Look to the left and there was a book-case with Grandma’s praying hands. She collected sculptures and small statues of praying hands. It is the symbol I associate most with her. Straight ahead was the kitchen where all the ladies gathered and the men headed around the corner to the living room or stood around the dining room table picking at all the different treats. There would be cousins, aunts, uncles, and friends filling the house. What I remember is the laughter. Always the laughter. My memory is my grandmother’s head thrown back, mouth open and a full hearty laugh that made you laugh right along with her. After my grandmother died the family tried to keep the traditions going but it was never the same. The gathering moved to our home for a bit and then to my aunts for a few years but as the cousins grew up lives became busy and each family had more and more to fit in to Christmas Eve and Christmas Day. But, even as I sit here and think of Christmas Eve I remember the laughter….forever. Previous Post Cookies, Cookies, Cookies! What a treasured keepsake for you! Your grandma sounds like she was a delightful woman! Thank you. She truly was one-of-a-kind. Thank you. They certainly are. What a beautiful, heart-felt gift. Thank you. It truly is special. When My Dad passed our Christmas’ fell apart. We tried but was never the same. Lovely to make new memories and keep the memories of the old alive in our hearts. Gifts like this one are indeed very special. Thank you. I haven’t been able to visit the cemetery since I moved away about 20 years ago but it all came flooding back with such a simple gift. So sweet of her. It is unbelievable how much something like that can hold. So thoughtful!! What a beautiful little ornament and so thoughtful of your aunt to send to everyone. I also love the sentimental items the most at Christmas time. Thank you. It is so incredibly thoughtful and sweet. I am a lover of the sentimental at all times. Thank you, she did an awesome thing with this gift. Grandmothers are always special and they live in our memories forever ! Those are wonderful memories to treasure, Marci! I remember all the family together when my grandparents were alive and how time/life slowly changed things. I’m happy you received such a special gift like that. Thank you, Sylvester! It was truly special. Hope you can bring back the good memories and times this Christmas. Hope you have a wonderful Christmas! Although it is sad that you have lost your Grandmother, Marci, you are very blessed to have such wonderful memories of her. Happy Christmas to you and yours. Thank you so much, Robbie! Same to you and yours. Pingback: My Wish for You… – What's for Dinner Moms? That is an amazing keepsake. Thank you, it means so very much to me.